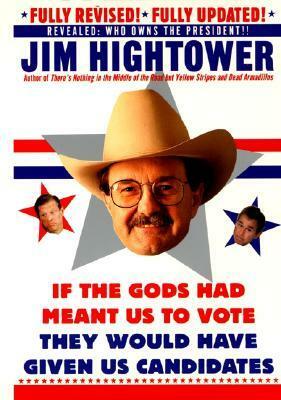 If the gods had wanted us to vote they would have given us candidates (2000). 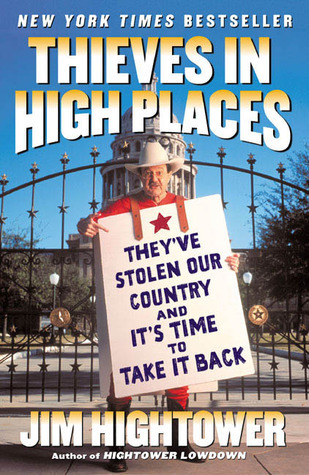 Funny but it makes you want to cry way, book of commentary and actual facts from Jim Hightower. He starts the introduction with a very appropriate word for the W days: Kleptocrat Nation. I have since learned another word that better suits the 2017 administration: kakistocracy. I wore myself out with my discussion of — and extensive quoting from — the other book of his I just finished, so I am going to just say READ BOTH BOOKS. He makes excellent points and is amusing while doing so. He criticizes a gushy (Republican) who was thrilled to have been elected to “the people’s house” which is basically full of millionaires. America is a nation of nurses, office workers, cabdrivers, school-teachers, pharmacists, shopkeepers, middle managers, truck drivers, shift workers, librarians, cleaning people, electricians, fruit pickers, struggling artists — how many of our ilk are sitting next to Sherwood in “the people’s house”? The great majority of Americans make less than $50,000 a year; half make under $32,000. How many members of Congress come from such modest backgrounds? Today’s Congress is made up of business executives, lawyers, and former political operative (which Boehlert was). The Public Interest Research Group reports that nearly half of the people newly elected to Congress last year  are millionaires. This is the personification of democracy? He does excellent take downs on W.
This ends abruptly because I took the book back to the library. I probably took some photos of a few last pages to comment on, but would have to find them to finish. This is a task that will take me hours because I have been negligent about uploading and filing. So if I ever do find anything more I had planned to comment on, I will add to the post. The weirdest thing has been happening with my time: tomorrow never comes! I think, yes, I will finish this up tomorrow, but next thing I know and a month has gone by. I hate that the old people were right when I was young that time flies when you are older!